Hi, my name is Yishai Shapir, from SpinLight 360®, with a couple of quick tips. First, to lock the modifiers in place, line up the three locking tabs with the three grooves, and while keeping one hand on the ring so it doesn’t turn, use the other hand to twist the modifier clockwise until it locks into place. You will hear a click when it’s locked in. You will need to twist with a little force to get it fully locked into the grooves, don’t be afraid to do it. Now I’ll lock in a snoot. If you have locked them in, there’s NO WAY the modifiers will fall or pop off! Now let me show you just how firmly the modifiers attach, and how strongly the whole system attaches to the flash…Please do not do try this yourselves! It is for demonstration purposes only. You can see I have a 70-200 2.8, EOS 1DX, and a flash, which is a very heavy setup. I’ll lift the whole setup just by holding the modifier. You can see, the modifier is clearly locked in place and the ring module is securely attached to the flash. Neither is going to pop off or go anywhere! 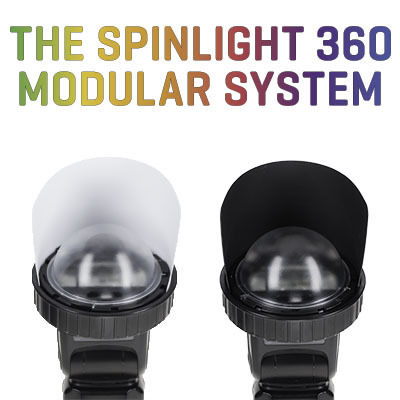 We built the SpinLight 360 System to be easy to use, secure, reliable and sturdy. We hope you enjoy it. Please feel free to like or share this video. You can also sign up on our website at www.spinlight360.com for our newsletter, tips, and updates.